Damaged brain pathways in children with cerebral palsy can result in stiff muscles that interfere with walking (spasticity) and other abnormal body movements. Neurosurgical procedures, like Selective Dorsal Rhizotomy and Baclofen pump placement, combined with orthopaedic surgery and intensive physical rehabilitation therapy, can improve the quality of life for children with cerebral palsy. The Peacock Center for Cerebral Palsy & Movement Disorders at Children’s Hospital & Research Center Oakland is the Northern California leader in the treatment of children with cerebral palsy and spasticity. The center’s team includes physical therapists, occupational therapists, pediatric neurosurgeons, pediatric rehabilitation physicians and pediatric orthopedist, Scott Hoffinger, MD. 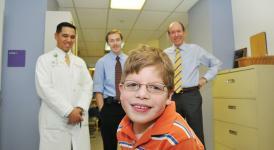 Dr. Hoffinger is an orthopaedic leader in cerebral palsy and the President of the Cerebral Palsy Academy in 2010. In 2009 the Center was named in honor of Warwick Peacock, MD, the founder of modern Selective Dorsal Rhizotomy surgery. He has collaborated with the Center’s clinical team for six years. “I’m proud to have this spasticity center named after me, it is the best in the West,” was Dr Peacock's response to the new center's name. He believes that "having a dedicated center allows the pediatric specialists here at Children's to collaborate on each child's unique condition and determine the most appropriate therapies, interventions and diagnostics on a case-by-case basis as a team"
Our program evaluates the child with our entire team and we offer the only pediatric inpatient rehabilitation unit in Northern California. The Peacock Center at Children's is the only center west of Kansas with such a wide range of services and expertise. What is Selective Dorsal Rhizotomy Surgery? Selective Dorsal Rhizotomy (SDR) is a surgery performed on certain children with cerebral palsy and spasticity. The purpose of the surgery is to reduce leg muscle stiffness and spasticity in these children. Reduced spasticity can improve or create the ability to walk for some children. The overall treatment program includes neurosurgery, intensive inpatient physical and occupational therapy, followed by orthopaedic surgery. A SDR surgery allows a child to be able walk or stand and transfer independently over a lifetime when he or she would have otherwise been bound to a wheelchair. An SDR surgery involves sectioning (cutting) of some of the sensory nerve fibers that come from the muscles and enter the spinal cord. The surgery is usually performed when children are between the ages of 6 and 16. Because there is so much overlap in the sensory innervations (the supply of nerve fibers) of the legs, there is no loss of sensation when the nerves are cut. We select the parts of the nerve under the microscope that is responsible for the spasticity by stimulating the individual nerve bundles to check for abnormal responses. The responses are monitored by our neurophysiology team. Those nerves with abnormal responses are then cut. We believe this deliberate effort in selecting abnormal nerves is important for an optimal outcome. In addition, in our center, SDR surgery requires only exposing one single level of the lumbar spine by lifting up the single bone and putting it back (lumbar laminoplasty). By exposing and lifting only one bone, there is little risk of spinal deformity. We believe that this selective method, as developed and refined by our team, is critical for safe, effective surgical results. Surgery is only one half of our rhizotomy treatment program. After SDR surgery, we admit the child to our inpatient rehabilitation unit for 4-6 weeks for intense inpatient therapy. We would not perform the surgery without an extended inpatient rehab program. Learning how to use their “new” legs is critical for these patients right after surgery. This learning is best done over a period of weeks in the rehab unit with our staff of experienced therapists. Most children with cerebral palsy, who undergo a SDR, will also have orthopaedic deformities. Nine to twelve months after the SDR surgery, they are evaluated by our pediatric orthopedist to consider treatment for these deformities. Results of the orthopaedic interventions are much better when abnormal muscle tightness has already been addressed. This orthopaedic intervention becomes the final phase of our entire treatment program. It helps to assure that a child with cerebral palsy and spasticity will become a "lifetime walker."